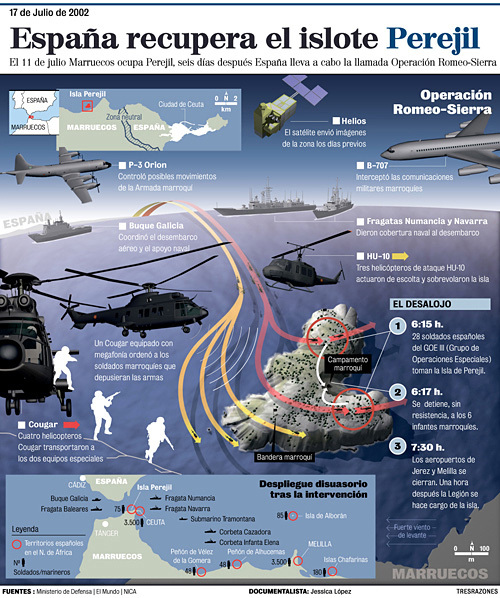 “España recupera el islote Perejil” (“Spain reccovers the Perejil islet”), answers the need to summarize in detail, in just one page, the Romero Sierra Operation, the first armed deployment after the beginning of the democracy. The disembarkment put the co-ordination between the three unified forces to the test (army, land force and air force). Therefore, the graph required to reproduce the forces that participated in the assault as faithfully as possible. In order to achieve it, the most laborious option was chosen, an option that gave the infographic spectacularity and realism: to represent in three dimensions the orography of Perejil and all the forces that participated in the assault. If modelling the helicopters, satellite, aircraft and frigates was complicated, it wasn’t less complicated to raise with 3ds Max the rugged relief of the islet and to place it in a sea that seemed realistic. The composition also posed some difficulties, given the great quantity of aircrafts that went to the area. Finally, it was decided to place the forces that participated directly or indirectly in the operation around the islet, accompanied by their corresponding explanations, and to highlight the red and yellow arrows, unequivocally Spanish, describing the trajectory of the helicopters that landed in Perejil. On its side, a chronology of the evacuation. The main scene is accompanied by a couple of localisers and a map in which the deterrent deployment of the national forces after the intervention is represented.